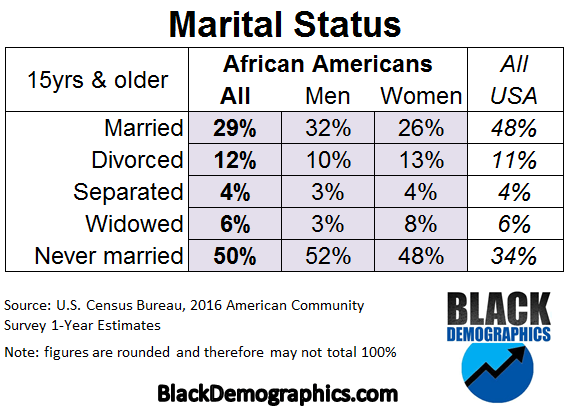 Marriage has been a declining institution among all Americans and this decline is even more evident in the Black community. In 2016 only 29% of African Americans were married compared to 48% of all Americans. Half or 50% of African Americans have never been married compared to 33% of all Americans. 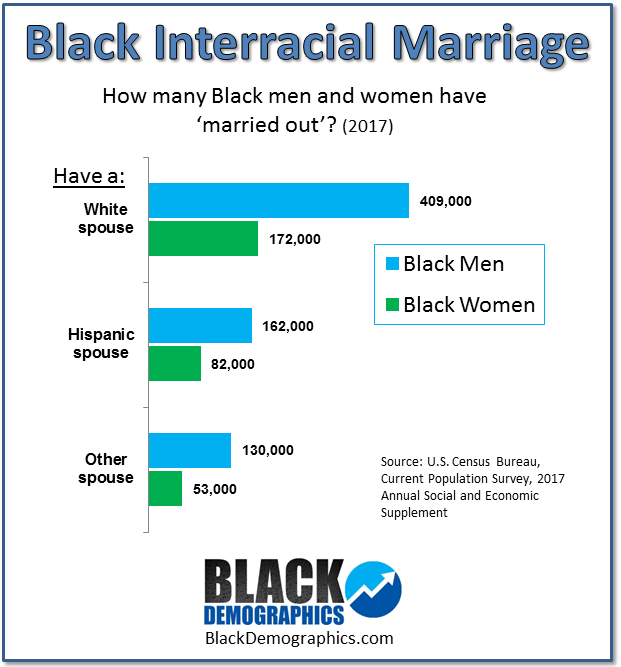 After viewing the available data, we can see that although fewer black women are “now married”, more black women than Black men have been married at least once. This is because a higher percentage of Black women are divorced and widowed than men. 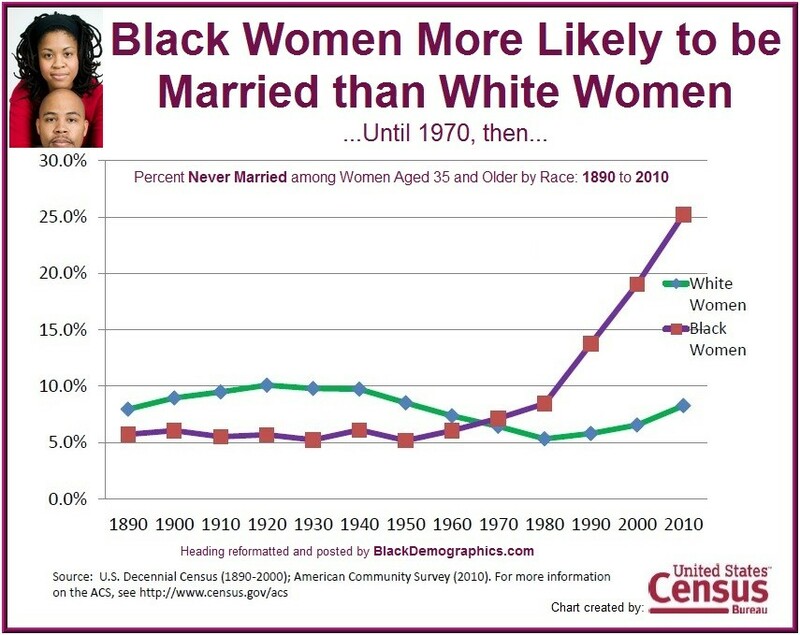 Also in 2016 just under half or 48% of black women had never been married which is up from 44% in 2008 and 42.7% in 2005. It is also believed that a large percentage of Black men marry White women. This is often cited as one of the causes of lower marriage rates among Black women. This however is only partially true. 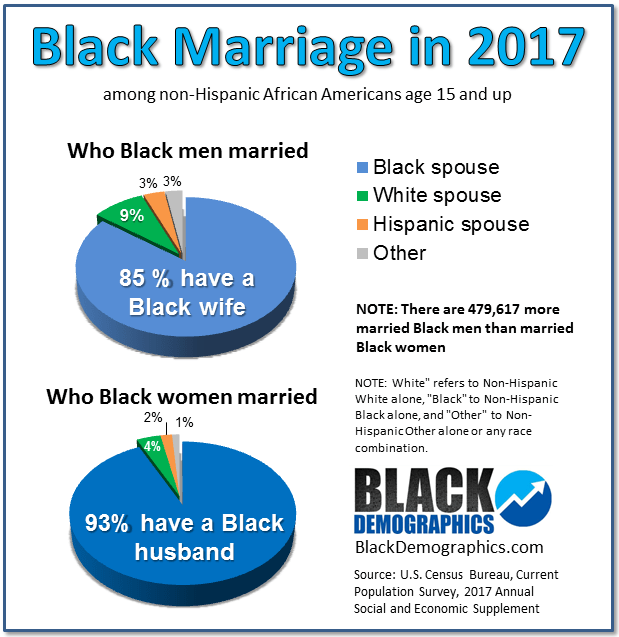 While Black men marry white women at twice rate that Black women marry White men, in 2017 only 15% percent of Black men were married to non-Black women which is up from 11% in 2010. About three-fifths of those non-Black women were White. So there is evidence of an increase of Black men “marrying out” of their racial demographic. As a matter of fact the Pew Research Center released a report finding that 25% of Black male newlyweds in 2013 married non-Black women compared to 12% of Black women who “married out”. However Asian women and Native Americans still have higher rates of interracial marriage. Black women were the least likely to marry non-Black men at only 7% in 2017, and only 4/% were married to White men. In 2012 The U.S Census Bureau released a report that studied the history of marriage in the United States. They discovered some startling statistics when calculating marriage by race. They found that African Americans age 35 and older were more likely to be married than White Americans from 1890 until sometime around the 1960s. 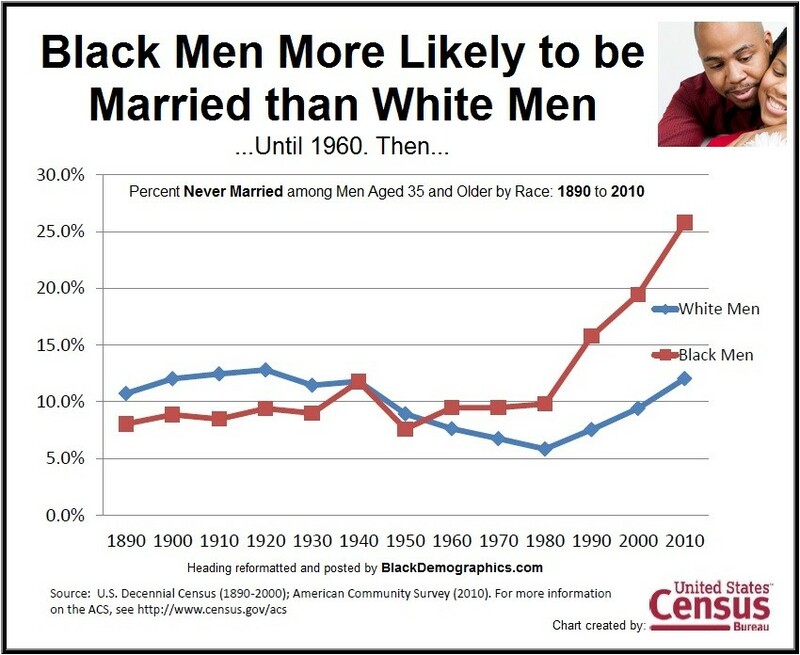 Not only did they swap places during the 60s but in 1980 the number of NEVER married African Americans began a staggering climb from about 10% to more than 25% by 2010 while the percentage for White women remained under 10% and just over 10% for White men. The first two charts below are charts included in the report only the headings have been altered by BlackDemographics.com to outline these findings. 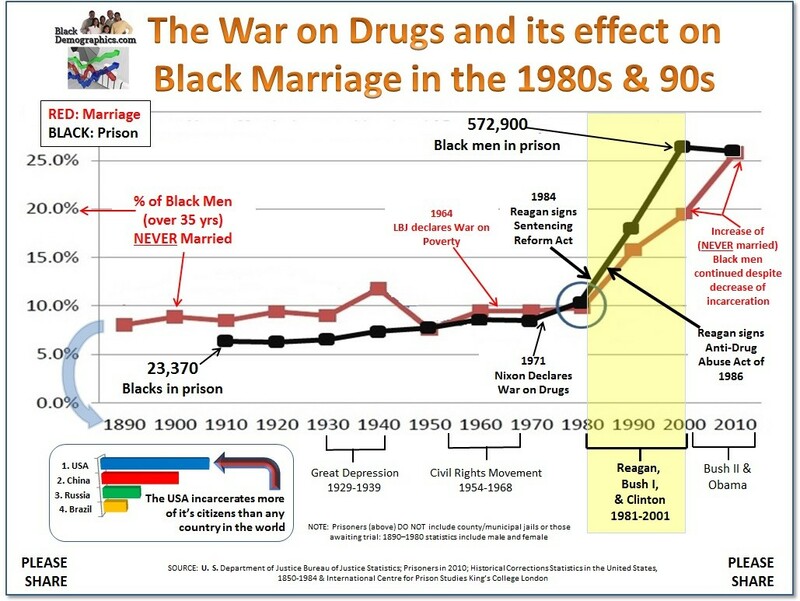 The third chart illustrates how closely the marriage graph for Black men aligns with the incarceration numbers which also experienced an abnormal climb beginning in 1980. This does not prove causation however it shows that they are related due to the assumption that men in prison are less likely to marry.